ORISAPIKKNEY WANTS TO SHARE THIS!!! GOOD TO KNOW!!! For all of you Jamaicans that knows this fruit!! It makes a very nice drink and for all the non-west indians, I thought it’s only fair that you should also know about this fruit. Can be bought at any west indian store. For what its worth, I wanted to share with all my friends and families. Don’t know if it is true or false but it’s worth passing on. 10,000 times stronger than Chemo. 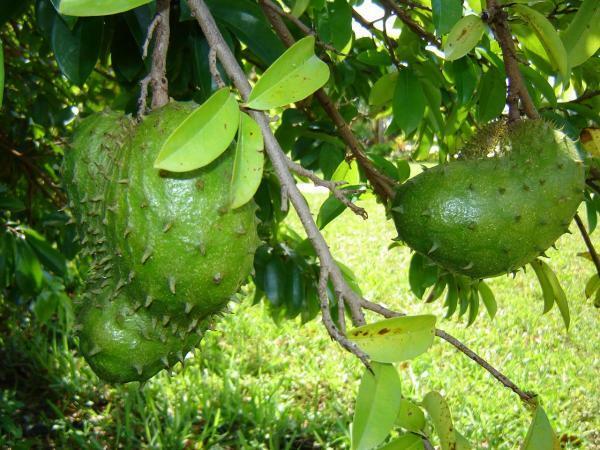 This tree is low and is called graviola in Brazil , guanabana in Spanish and has the uninspiring name “soursop” in English. The fruit is very large and the subacid sweet white pulp is eaten out of hand or, more commonly, used to make fruit drinks, sherbets and such. If there ever was a single example that makes it dramatically clear why the existence of Health Sciences Institute is so vital to Americans like you, it’s the incredible story behind the Graviola tree. down and kills only cancer cells. It does not harm healthy cells! The amazing anti-cancer properties of the Graviola tree have been extensively researched–so why haven’t you heard anything about it? If Graviola extract is as half as promising as it appears to be–why doesn’t every single oncologist at every major hospital insist on using it on all his or her patients? The spine-chilling answer illustrates just how easily our health–and for many, our very lives(! )–are controlled by money and power. Various parts of the Graviola tree–including the bark, leaves, roots, fruit and fruit-seeds–have been used for centuries by medicine men and native Indians in South America to treat heart disease, asthma, liver problems and arthritis. Going on very little documented scientific evidence, the company poured money and resources into testing the tree’s anti-cancerous properties–and were shocked by the results. Graviola proved itself to be a cancer-killing dynamo. synthesize two of the Graviola tree’s most powerful anti-cancer ingredients. If they could isolate and produce man-made clones of what makes the Graviola so potent, they’d be able to patent it and make their money back. Alas, they hit a brick wall. The original simply could not be replicated. There was no way the company could protect its profits–or even make back the millions it poured into research. When researchers at the Health Sciences Institute were alerted to the news of Graviola, they began tracking the research done on the cancer-killing tree. Evidence of the astounding effectiveness of Graviola–and its shocking cover-up–came in fast and furious…. cancers… Seven years of silence broken–it’s finally here! A limited supply of Graviola extract, grown and harvested by indigenous people in Brazil , is finally available in America . The full Graviola Story–including where you can get it and how to use it–is included in Beyond Chemotherapy: New Cancer Killers, Safe as Mother’s Milk, a Health Sciences Institute FREE special bonus report on natural substances that will effectively revolutionize the fight against cancer. MANIAC WANTED TO SHARE THIS/MI PICKNEY DEM A GWAN GOOD!!! A lot of people should know about this instead of paying thousands of dollars just to get to the next day when the can get rid of it all together naturally. great info Orisapikney, das y me like da site yah!! dem deh a Africa a stone dog!